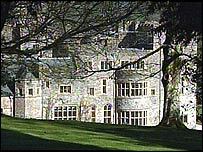 Thirty people at a Devon stately home are celebrating after a property developer saved the house from closure. Flete House near Modbury was one of eight houses which were put up for sale when the Country Houses' Association (CHA) went into liquidation last year. Residents, some in their 80s and 90s, were told in December they had six months to leave. Now Raven Group Ltd has bought the house for an undisclosed figure and will allow the residents to stay. Resident David Brook told BBC News Online: "We're very happy, it's an immense relief for us because the atmosphere has been terrible since the CHA announced they were pulling out." Raven, which completed the purchase of the house on Friday, will take on the remaining 17 years of the lease, which may be extended following negotiations with the liquidators Deloitte & Touche. The residents are mainly retired professionals who paid deposits of up to £140,000 to rent the apartments. Mr Brook said: "Raven has already treated us in a much more honourable way than the CHA. "It has been very difficult for us and it has not been made any easier by the way that the CHA made the announcement, totally out of the blue." Buyers have been found for six of the eight stately homes owned by the CHA which went into liquidation last year. Deloitte & Touche, the liquidator, confirmed that the six mansions, including Flete House, have been sold as "going concerns", meaning that residents can remain in their apartments - although their rents and terms of occupancy are likely to change. Residents, who will be meeting Raven Group this week, have already been told that they have a further six months at Flete without any changes to their terms. No-one was available for comment from the Raven Group.